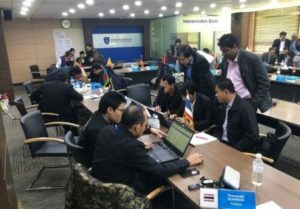 The 4th Single Window Masterclass has been held 5-14 November 2018, in the Customs Border Control Training Institute (CBCTI) of the Republic of Korea, focusing on business processes relating to dematerialized licences, permits, certificates and other regulatory requirements (e-LPCO) in a Single Window environment. The Masterclass covered various topics relating to the challenges for onboarding new regulatory services in Single Window platforms: applying and issuing e-LPCO, information exchange, and the validation and back-end verification of supporting documents submitted with Customs declarations. It started with theoretical enlightenment, and went on to deliver practical exercises on business process analysis, modelling and re-engineering, and harmonization of regulatory requirements. WCO, United Nations Economic and Social Commission for Asia and the Pacific (UN ESCAP) and Convention on International Trade in Endangered Species of Wild Fauna and Flora (CITES) experts shared their experience of recent initiatives to develop standards, guidelines and programmes on the interoperability of national and cross-border information exchanges. In addition, the Asian Development Bank (ADB) shared its experience of supporting Asian Pacific Members as they move towards building a Single Window environment. The Korean Customs Service and other Ministries from the Republic of Korea described the Korean Customs clearance environment and the business processes available in the Korean Single Window, “UNIPASS.” Participants also visited Busan Sea Port, which is considered to be a “smart” port and has almost full automation of terminal procedures. This gave practical insight into how the Port Community Systems are interoperating in the Single Window environment with the Single Window system. The workshop also looked at future developments in the area of new technologies, including technological advancements such as “Big Data” and “Blockchains”, and their possible application in managing international supply chains and the Customs business environment. A total of thirty-four participants attended, with many describing their SW initiatives. They came from WCO Customs administrations and other cross-border regulatory agencies, as well as UNESCAP Members. The countries represented were: Afghanistan, Armenia, Bangladesh, Bhutan, Cambodia, China, Fiji, Iran, Laos, Malaysia, Maldives, Myanmar, Nepal, Pakistan, Papua New Guinea, Sri Lanka, Thailand, Timor-Leste, Tonga, Vanuatu and Vietnam.